q Secondly, to determine at which dosage Cellfood® tend to be most effective. 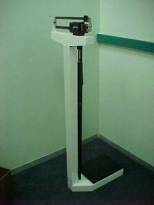 In its broadest sense, one could call anything that can be related to an improvement in work or performance an ergogenic aid. Ergogenic aids affect different people differently, as might be expected. For some, studies show a positive influence on work performance and for others, no affect whatsoever. What might prove effective with the athlete may prove inconsequential to the nonathlete and vice versa. Certain ergogenic aids may influence a person’s endurance performance but may have little or no effect on activities requiring short bursts of strength and power (Fox and Bowers, 1993; Williams, 1983). Forty-five marathon runners between the ages of 20-51 years (mean age = 38,4 ± 8.2 years) volunteered to take part in the study. 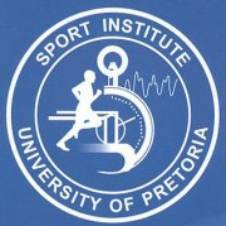 All of the participants were members of marathon clubs in and around Pretoria. They were all briefed on the nature of the research project and possible risks involved. They were not allowed strenuous training the day before each test. The primary aim of the study was to determine the efficacy of Cellfood® as an ergogenic aid for endurance athletes. In order to reach this goal a pre-test – post-test, experimental design, was adopted for the study. Subjects were randomly assigned to one of two groups. q Subject’s head was held up and the eyes looked directly ahead. q METS: Metabolic Equivalents- Oxygen uptake required for a given task expressed as multiples of resting oxygen uptake. q VT: Tidal volume- The volume of air actually breathed per breath in ml. q V02 relative: V02 expressed in ml/kg/min. 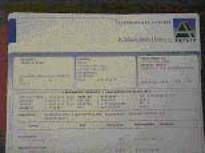 q VC02: The amount of carbon dioxide (C02) exhaled from the body into the atmosphere per unit time, expressed in millilitres or liters per minute, STPD. This differs from C02 production rate under conditions in which additional C02 may be evolved from the body stores or C02 is added to the body stores. In steady state, C02 output equals C02 production rate. In rare circumstances, appreciable quantities of C02 can be eliminated from the body as bicarbonate via the gastro-intestinal tract or by haemodialysis. q RQ: The respiratory quotient is the rate of carbon dioxide production to oxygen consumption. This ratio reflects the metabolic exchange of gasses in the bodies’ tissue and is dictated by substrate utilization. q VE/V02: Respiration equivalent for oxygen is the actual ventilation against absolute oxygen uptake. This parameter indicates how much air (l) must be inhaled to obtain a liter of oxygen. q VE/VC02: Respiration equivalent for carbon dioxide is the actual ventilation against absolute carbon dioxide exhaled. This parameter indicates how much air (l) must be exhaled for one liter of carbon dioxide to be expelled. The smaller this parameter the better the carbon dioxide exchange efficiency. 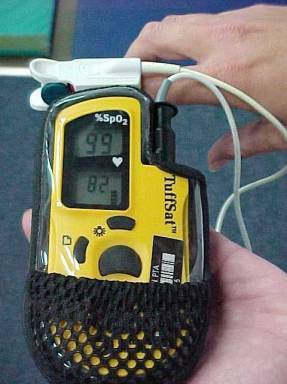 Incremental haemoglobin oxygen saturation levels were taken using a Datex- Ohmeda TuffSat hand-held pulse oximeter. 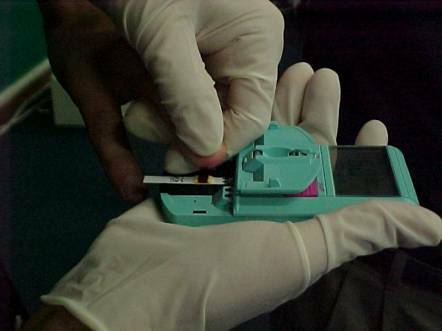 The measurements were taken using a finger probe (ClipTip -sensor). These measurements were taken at the end of each two-minute stage directly after the blood samples were taken, expressed as a percentage. Iron (ferretin) has two very important exercise related functions. Firstly, about 80% of the iron in the body is in functionally active compounds combined with haemoglobin in red blood cells. This iron-protein compound increases the oxygen carrying capacity of the blood about 65 times. Secondly, iron (about 5%) is a structural component of myoglobin, which aids in the transport and storage of oxygen within muscle cells (McCardle, Katch and Katch, 1991) About 20% of the iron in the body is found in the liver, spleen and bone marrow in the forms of hemosiderin and ferretin. Since ferretin is present in the plasma it is an excellent indicator of the iron stores of the body (Meyer and Meij, 1996) Normal iron levels are crucial in preventing conditions such as iron deficiency anaemia (McArdle et al., 1991). Iron deficiency anaemia is characterized by sluggishness, loss of appetite and a reduced capacity for sustaining even mild exercise (McArdle et al., 1991). Keeping the above-mentioned in mind one can see why it would be beneficial if either one of the products would be effective in increasing the iron stores in the body. Haemoglobin is essential for the transport of both oxygen and carbon dioxide. Haemoglobin also serves the important function of acting as an acid base balance buffer (Meyer and Meij, 1996). Oxygen is not very soluble in fluid substances, only about 0.3ml gaseous oxygen dissolves in each 100ml of plasma. Although this is a very small amount it serves an important physiological purpose in establishing the P02 of the blood and the tissues. This pressure plays a role in the regulation of breathing and also determines the loading and release of oxygen from haemoglobin in the lungs and tissues respectively (McCardle, Katch and Katch, 1991). This means that the majority of oxygen is carried through the body in chemical combinations. This takes place with the help of haemoglobin. Haemoglobin contributes to about 34% of the volume of a red blood cell. Haemoglobin increases the blood’s oxygen carrying capacity with about 65 to 70 times compared to that of the dissolved oxygen in the plasma. Thus for each liter of blood about 197ml of oxygen are carried through the body in chemical combination with haemoglobin (McCardle, Katch and Katch, 1991) Men have approximately 15-16 g of haemoglobin in each 100ml of blood. The blood’s oxygen carrying capacity changes only slightly with normal variations in haemoglobin values, while a significant decrease in iron content of the red blood cells will lead to a decrease in the blood’s oxygen carrying capacity and corresponding reduced capacity for sustaining even mild aerobic exercise (McCardle, Katch and Katch, 1991). It is possible to determine the amount of red blood cells per volume unit of blood. The average count for adults males vary from 4.6 to 6.2 x 10 12 /l blood and adult woman from 4.2 to 5.4 x 1012 /l. The red cell count is higher in newborn babies as well as people who live at high levels above sea level. The values could also be higher or lower during certain illnesses (Meyer and Meij, 1996). Three of the main functions of red blood cells include the following: firstly they are responsible for the transport of oxygen from the lungs to the tissue and transport of carbon dioxide from the tissue to the lungs. Secondly, red blood cells help to maintain pH homeostasis within the body. Thirdly, red blood cells contribute just as much to the viscosity of the blood as plasma proteins. 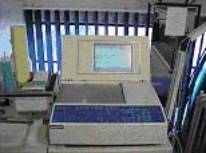 Hematocrit refers to the contribution of cells to a certain volume of blood. White blood cells contribute less than 0.08% to the hematocrit. The contribution of cells is higher in newly born infants and people who live at high levels above sea level as well as people that is dehydrated and people with high red cell counts. The values are lower in people who suffer from anaemia (Meyer and Meij, 1996). After using Cellfood at a dosage of 15 drops once a day the athletes showed increases in all of the above mentioned haematology variables. It is important to note that all the values remained within the physiological limits although there were increases.. All the mentioned changes (increases) will aid the athlete’s in their ability to transport oxygen through their bodies to their working muscles. Lactate is one of the products of glycolysis. It is both produced and used by the muscles. It’s rate of production increases as the exercise rate increases and as more carbohydrates is used to fuel exercise (Noakes, 1992) Glycolysis refers to the process where carbohydrates are broken down to pyruvic acid or lactic acid (Meyer and Meij, 1996). Lactic acid does not necessarily accumulate at all levels of exercise. 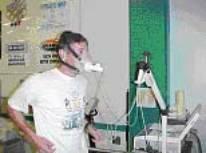 During light and moderate exercise the energy demands are adequately met by reactions that use oxygen. In biochemical terms, the ATP for muscular contraction is made available predominantly through energy generated by the oxidation of hydrogen. Any lactic acid formed during light exercise is rapidly oxidized. As such, the blood lactic acid levels remains fairly stable even though oxygen consumption increases. Lactic acid begins to accumulate and rise in an exponential fashion at about 55% of the healthy, untrained subject’s maximal capacity for aerobic metabolism. 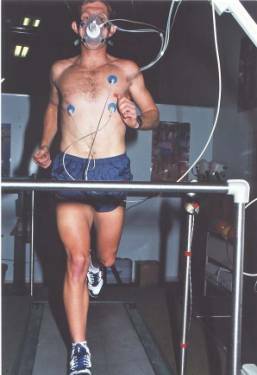 The usual explanation for the increase in lactic acid is based on the assumption of a relative tissue hypoxia (lack of adequate oxygen) in heavy exercise (McCardle, Katch and Katch, 1991). For this reason it would be beneficial to the athlete if Cellfood could help the oxygen supply to the muscle and surrounding tissue, preventing or rather delaying the onset of hypoxia due to increased exercise intensity. An untrained individual who fasted overnight and who has a sample of blood collected in the morning from an arm vein before any exercise, has a lactate level ranging from 0.44 to 1.7 mmol/L. 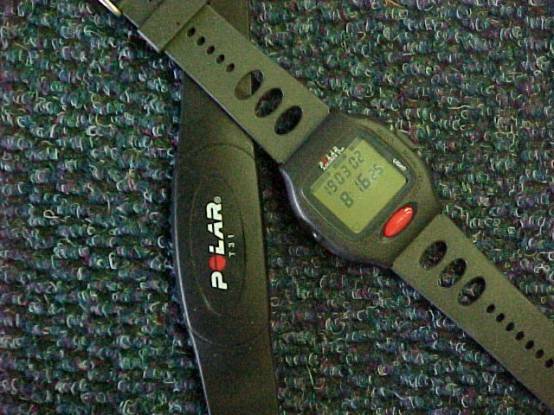 Martin and Coe (1997) also found the equivalent of 0.3 to 0.6 mmol/L to be true for trained individuals, providing that they are not over trained. Within an hour after an intensive training session during which blood lactate levels reach the highest achievable values (15mmol/L), muscle lactate levels will return to normal (Noakes, 1992). Lactic acid produced in working muscles is almost completely dissociated into H+ and lactate within the range of physiological pH, which contributes to the metabolic acidosis (Hirokoba, 1992). Cellfood was very effective in decreasing lactate values during the test. The most effective dosage was at 15 drops once a day. 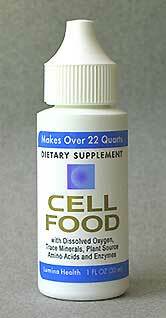 Cellfood made for lower lactate values at all the comparative running speeds during the test. Lower lactate values would definitely be beneficial to the endurance athlete. Decreases ranged between 10 and 25%. The working of Cellfood on various systems in the body made it possible to detect an increase in the absolute V02 max of the athletes. The most effective dosage again was that of 17 drops a day, which resulted in an increase of 5%. It is clear that a certain pattern exists regarding the optimal dosage for performance when using the Celfood® product. Concerning the haematology and the lactate accumulation CellfoodÒ was the most effective using a dosage of 39.2ml (35 drops once per day) while CellfoodÒ showed the best results in all the other variables when the subjects took a dosage of 44.8ml (40 drops once per day). 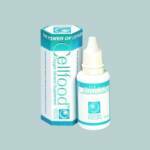 This indicates that Cellfood® is more effective when it is administered at the higher of the tested dosages. Further studies could possibly answer the question if Cellfood® would reach an upper “threshold” dosage where after the efficacy would show a decline. In conclusion it would be best for athletes to make use of Cellfood® at a higher dosage to ensure better performance. METS: This term is used as an equivalent for maximal oxygen uptake. One MET is equal to 3.5ml/02/kg/min. This value is often used to determine a person’s relative working intensity. RR: Respiration rate refers to the number of breaths taken per minute. Respiration rate multiplied by tidal volume is an indication of a person’s minute ventilation. V02: The maximum amount of oxygen that the body can take in, use and transport through the body to the working muscles. This is an accurate predictor of a person’s potential to perform well at endurance events that make use of the aerobic energy system in the body. RQ: The respiratory quotient refers to the rate of carbon dioxide production to that of oxygen consumption. This value is a good indication of a person’s work rate and also indicates what type of substrate is being utilized as energy, fat, protein or carbohydrates. VE/V02: The breathing equivalent for oxygen indicates the amount of air that needs to be inhaled to obtain one liter of oxygen. The lower this value during maximal effort the better the person’s ability is to extract oxygen from ambient air. VE/VC02: The breathing equivalent for carbon dioxide indicates the amount of air that needs to be exhaled for one liter of carbon dioxide to be expelled. The lower this value the better the person’s ability to rid the body of excess carbon dioxide.